Tune in on Friday, August 4 as we celebrate the alternate birthday of Jazz great and American hero, trumpeter and vocalist Louis Armstrong Louis Armstrong with 24 hours of only his music beginning at midnight. Armstrong chose to celebrate his birthday on July 4th every year, which we also honor with a memorial broadcast. Louis was born in New Orleans at the turn of the century (officially on August 4th) and grew up surrounded by a vibrant musical culture informed by the rags of Scott Joplin and the funeral marches that comprised the New Orleans music scene. Louis took up the trumpet and by 1922 was a featured soloist with King Oliver's Creole Jazz Band, serving as a melodic foil to the pyrotechnics of a young King Oliver. By 1924 he had quit Oliver's group, and moved to New York City to play with the Fletcher Henderson Orchestra (which then also featured a young Coleman Hawkins). In 1927, Louis created some of his most famous recordings with the Hot Fives and Hot Sevens, which featured luminaries such as Kid Ory, Lil' Hardin, Earl Hines, Johnny Dodds, Johnny St. Cyr. In 1929, Armstrong was featured as a soloist in Fats Waller's pit orchestra for the production Hot Chocolates, and received acclaim for his work on the tune "Ain't Misbehavin." Louis would later form a prolific big band led by Luis Russell and Carol Dickerson at points that would go on a whirlwind tour of Europe and return to the states in 1935. 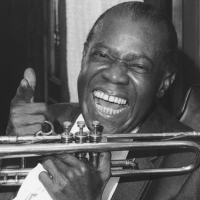 In 1947, Louis' manager, Joe Glaser, fired the group and formed a new smaller group titled "Louis Armstrong's All Stars," which featured personnages such as Jack Teagarden, Earl Hines, Barney Bigard, Sid Catlett, and Trummy Young. For the remainder of his life, Louis would have a string of hits with this group and would go on to record definitive versions of tunes such as "Hello, Dolly" and "What A Wonderful World." Throughout his life, Armstrong became the definitive model for individualism in jazz. He crafted an exceedingly melodic but pyrotechnical trumpet style that would influence all who followed him; not to mention his gruff but soulful vocal stylings, which would influence Ella Fitzgerald and Billie Holiday. While he wasn't a composer, Louis was the father of jazz as we know it today and a profound cultural ambassador for this incredible music.